Black holes and pulsars could reveal extra dimensions, solving that thorny problem of testing string theory, which attempts to unify all the known forces. String theory calls for extra spatial dimensions beyond the three we experience. Testing the theory has proved difficult, however. But that hasn't stopped John Simonetti of Virginia Tech in Blacksburg and colleagues who say black holes orbited by neutron stars called pulsars could do just that – if cosmic surveys can locate such pairings. “The universe contains ‘experimental’ setups we cannot produce on Earth,” he says. Black holes are predicted to cast off their mass over time by emitting particles, a phenomenon called Hawking radiation. Without extra dimensions, this process is predicted to be incredibly slow for run-of-the-mill black holes weighing a few times as much as the sun, making it impossible to measure. Extra dimensions would give the particles more ways to escape, speeding up the process. This rapid weight loss would loosen a black hole's gravitational grip on any orbiting objects, causing them to spiral outwards by a few metres per year, the team calculates. A pulsar orbiting a black hole could reveal this distancing. That's because the lighthouse-like pulses of radiation they emit would vary slightly depending on the size of the star's orbit. Mathematical physicist Peter Woit of Columbia University challenges Simonetti's premise: "String theory predicts nothing about these supposed extra dimensions, they could be any size whatsover and have all sorts of different properties. So, even if there are extra dimensions, and you manage to get yourself a pulsar and a black hole with just the right properties to see evidence for them, this in no sense “tests” string theory." Image at the top of page shows the Crab Pulsar, a neutron star remnant of the supernova which is roughly 10 km in diameter. It was discovered in 1969. 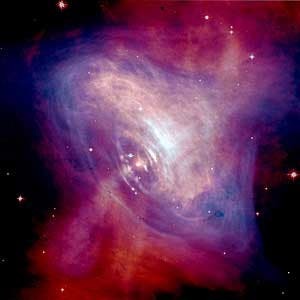 The Crab Pulsar rotates once every 33 milliseconds, or 30 times each second, and the beams of radiation it emits interact with the nebular gases to produce complex patterns of wind and fluorescence. The most dynamic feature in the inner part of the Crab is the point where one of the pulsar's polar jets runs into the surrounding material forming a shock front. The shape and position of this feature shifts rapidly, with the equatorial wind appearing as a series of wisp-like features that steepen, brighten, then fade as they move away from the pulsar to well out into the main body of the nebula.